The Department of South Asian Languages and Civilizations at the University of Chicago is pleased to announce the Fourth Norman Cutler Conference on South Asian Literature (COSAL), featuring noted Marathi author Malika Amar Shaikh. Readings of her work will include selections from both her poetry and her prose (autobiography, short stories, and a novel). "Written from the Margins: Malika Amar Shaikh and Marathi Women Writers over the Centuries." The breadth of this canvas is intended to allow invited scholars in the field (from the United States, Great Britain, and India) to explore in their papers the larger contexts and wide-ranging historical and social locations of women's writing in Marathi and the multifarious forms and registers of the Marathi language they have employed: ranging from the 13th-century Yadava Period through the 15th-century Bahmani, from the 17th-century Shivakalin through the 18th-century Peshwai, from the Colonial through the Post-Colonial and Contemporary, all periods that have produced Marathi women's writing. The keynote address will be given by Vidyut Bhagwat, Professor Emerita and retired Head of the Centre for Women's Studies, University of Pune, India. 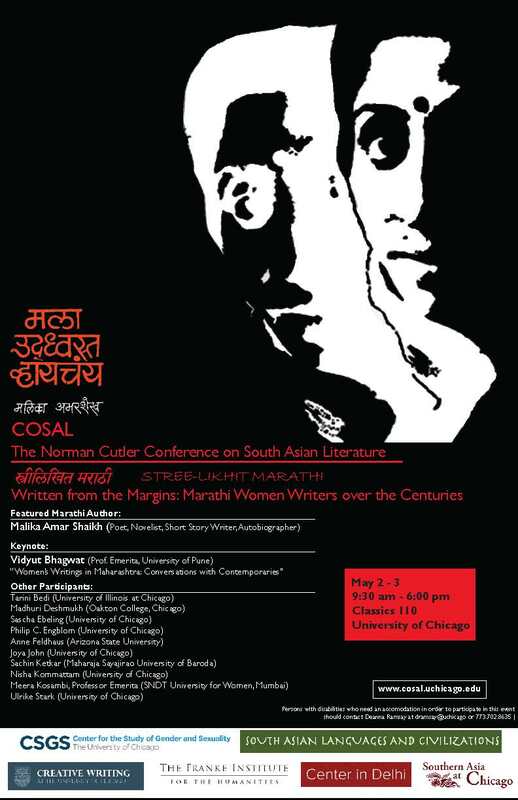 The 2014 COSAL is sponsored by the University of Chicago's Committee on Southern Asian Studies, the Franke Institute for the Humanities, the Creative Writing Program, the Gender Studies Program, and the University of Chicago Center in Delhi.